Incarnation of the spirit allows to shift one or several levels. Humanity itself finds itself in a major shift of paradigm as we speak, which is actually a leap of consciousness. It is not just by chance the partnership between horses and humanity is so strong. We – kind of – never let each other down. Other reigns have manifested their revolt against humanity (cows, porc, some plants, birds, fish, rats,…). Now there is a major thing horse spirits can learn from us (it took me 14 years to get it): learn individuality. Horses are herd animals, ready for individuation. He’s not any more “part of” a herd, but exists by himself. This is where we people come into the picture: true encounter between a person and a horse can make the horse feel unique, special, like we humans can and should feel, unique and special. And actually, this is also something we people have to learn more: feel unique and special in our talent. So this truly is a win-win game. Competition, equitherapy, horse coaching, Equitao, ethology, horse whispering are all manifestations of this evidence. In 1999 I channeled the will of a fabulous horse, Shah, who got a life-changing message to me. It changed the course of my life forever. The basic message was that I should discover the true value of relation between human beings and horses. It took lots lecture, experiences, travel, workshops, spiritual connexion and succeeding a 20 years marriage with a jumping champion and horse lover to get the point here. Over these years, I have witnessed incredible teaching and initiation offered by horses to the people we had in our Equitao workshops. 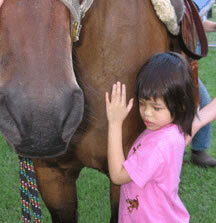 I witnessed the evolution of my wife’s and daughter’s, in relation to their horses – a wonderful gift of life. I got the point today when I saw my daughter playing around for half an hour with an unknown pony in Istanbul. The pony loved it, my daughter loved it. They both progressed in life today, and exist a little more as unique and special beings. The supreme keys to succeed this are : unconditional love, presence, empathy. That’s it: look at all beings as unique and special, look through appearances and get the best out of any encounter or relation. The more different you are, the more gifts you can get from this encounter. Bless you all. This entry was posted in Natural Horsemanship. Bookmark the permalink. 1 Response to Horses offer lots of value – What can we human beings give back to them ? Indeed ! it is my husband who kind of awakened me as well concerning the real partnership between the horse and humans. Thank you for your comment and following us.